Make that two fine days: one in Bangkok and the other in Singapore. Both hot days too, as I remember (especially Bangkok, it was 36 degrees but felt like 40 degrees that day), and not the least because of the wattage that is Jung Yonghwa onstage. Of course, everyone who has encountered CNBLUE knows who JYH is: the energetic/Mr Nice Guy/king of fan service and leader of the band Jung Yonghwa who rocks stages with his guitar and rocks the socks off fangirls through small screens with his puppy eyes. By now, it is cliche to say that watching the band and JYH live is a must for every fangirl. But JYH on his own, without his three bandmates, is still something definitely worth experiencing. The dude is a livewire and to be able to hold the attention of the audience for two hours on his own is definitely a feat. Obviously, One Fine Day the concert is a one-man show. Sure, he is backed by an able band who we get to know when Yonghwa introduces each of them (starting off with “are you happy?” and “your feelings in guitar/piano/drums/song”) with his artist’s impressions of the band members flashed onscreen. That’s one thing that hit me about JYH while watching him onstage–he’s an all-around performer: rocker, musician, composer, actor, artist, comedian, host and, okay, dancer. Plus he has a great personality too that there is no dull moment during OFD and sometimes, all he needs to do is just stand there and the fangirls go screaming their heads off. I also love the way the stage was mounted with several screens capturing different angles of Yonghwa. Even those far from the stage could still appreciate his close-ups (and god knows how his fans love to gawk at his chest), although sometimes, forgive me YH, I find the disconnect between the dark smexy metal and the goofy smile. His dorky personality comes to the fore too especially when he impersonates artists like Liam Gallagher of Oasis (Supersonic) and Jon Bon Jovi (You Give Love a Bad Name). He’s good at mimicking artists in as much as he’s also good with languages that he would blurt out slang phrases depending on the city where he is performing (I still can’t forget how he trolled “khop khun kha/sawasdee kha” in Bangkok and his “Thank you lah” in Singapore). But what I love the most is how he has rearranged some of the songs in his concert repertoire. No matter how good a song is, it reaches saturation point if you’ve listened to it countless of times and he obviously knows that. (Side note: I read this interesting article on artists who hated performing some of their hit songs; very interesting.) That’s why many of the songs in OFD, especially those by the band, has been given new arrangements that I wonder if the disassociation was deliberate like in Love Light, which is a perennial crowd favorite and was given several versions from reggae to rock it was almost unrecognizable from the original. I also love the rearranged Can’t Stop, Man in the Mirror and Feeling. The new arrangements keep the music fresh and help set OFD apart from CNBLUE concerts. Four songs in his OFD album are duets too but obviously, the artists couldn’t be at his concerts so singing their parts fell on Yonghwa. And this is when you see the showmanship and versatility of JYH when he sings the Mandarin lines of JJ Lin for Checkmate and Yang Dong-gun’s mumbling rap for Mileage. His impression of YDG is on point that it was both hilarious and impressive. But it’s the voice that takes my breath away. A friend, who knows who he is but never listened to him, was surprised when she finally gave him an ear. “I didn’t know Jung Yonghwa sounds like that.” While his high octane, powerful voice easily captivates his audience, it’s his soothing melodies that capture hearts. Whether it’s rock, pop or ballads, Yonghwa’s voice is distinct and memorable. That’s why One Fine Day is a fitting finale to the concert because one goes away with that voice in mind. Is there anything that JYH can’t do? His fans always love to say he can do everything and his solo concert proves that further. He not only sings and entertains, he plays the guitar and the keyboards too (maybe drums in the future, yes?). He even produced his own reality show via Hologram to promote the album. I would really love to see JYH scaling new and higher heights with his talent and be unhampered by his idol looks and idol status, and what fans want from and for him. Because you know, it’s very rare to find an artist like him in an industry that’s dominated by idol factories churning out more of the same prototype. 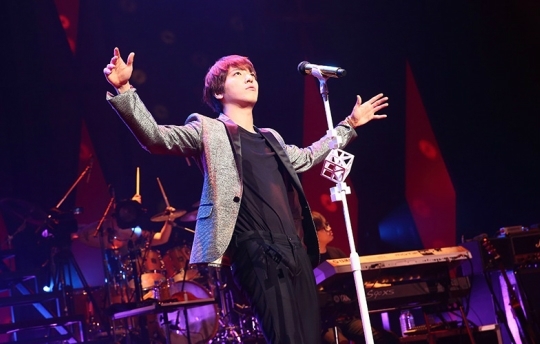 And in OFD, both the album and the concert, Yonghwa proves that he is one fine talent. Ni xin ku le, Jung Yonghwa! Otsukaresama deshita! ← [blog] that Arashi bond: is it real, a myth or just urban legend? I’ve been following the OFD tour since the start and what I find even more impressive is how JYH constantly updates and improv on the concert repertoire even as the concert tour is ongoing. Case in point – LL, as you’ve pointed out *hiak hiak* That’s some professionalism, and a real treat for us fans! And man, I’m super impressed by his English and Mandarin pronunciation and YDG impersonation! I thought the new arrangements for some of the band’s (CNBLUE) songs in their recent concerts was very interesting as well. It’s clear that YH (and the other guys) realize that fresh arrangements breathe new life into the songs, especially the ones they’ve played a million times. It’s a great concert for me, the sound system much much better than the indoor stadium…and I can hear payphone live…maybe next time I can hear BIMY live too. oh maaan I would love to hear BIMY live too! You lucky buggers… 🙂 Living more or less on the other side of the globe has it’s disadvantages. Unless either CNB or Yong Hwa somehow land a gig in these parts, I’ll never see them live. Sigh. Yong Hwa is really born for the stage and like what his BFF Ms PSH says, he shines the brightest on stage. I’ve been lucky to attend 6 of his OFD concerts, 3 in Korea (spur of the moment decision), HK and Shanghai (planned to coincide with my business trips..kekeke) and of course Singapore, my home turf. I can honestly say that he brings his all in each and everyone, and yet each has a slightly different vibe. That’s how amazing he can be. I have to say that I enjoyed the Singapore one the most, maybe because it’s at my home turf, but I felt he had a relaxed air when he performed in Singapore and he enjoyed himself so much that it just felt amazing.